Derek Flint is an agent for ZOWIE. ZOWIE stands for the Zonal Organization World Intelligence Espionage. 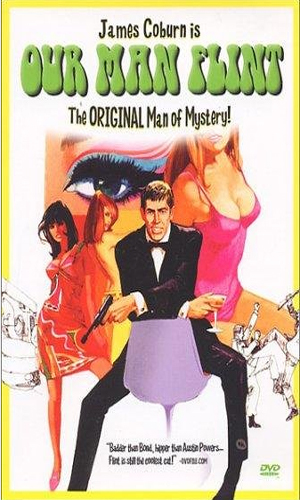 In 1965, 20th Century Fox presented its own version of a master spy to take on MGM's popular James Bond franchise. 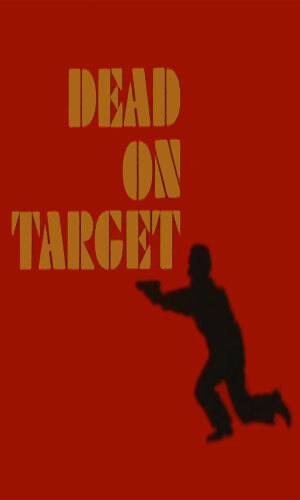 The first three James Bond movies had already made considerable money for that studio so Fox decided to try for itself. Their hero was wholly a celluloid creation, however, not a transfer from a book series. Derek Flint was the creation of Hal Fimberg, whose writing credentials, though sparse, did go back quite a few years. 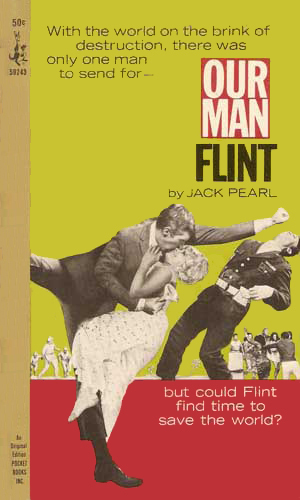 Whether it was in keeping with a growing trend to try and 'out-Bond Bond' or, more likely, to spoof the very macho Double-0 agent, Flint was the best at whatever he did and he did a lot. 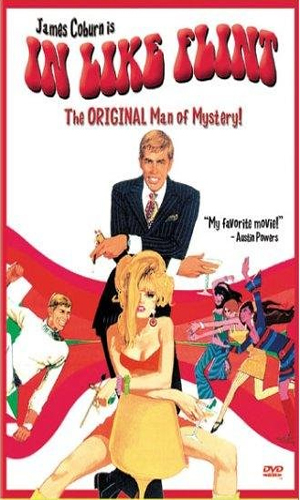 The movie, which came out in 1965, did quite well and turned star James Coburn into a leading man. From gruff, simmering ruffian-style characters he had played before, Coburn portrayed an extremely suave, sophisticated man-of-the-world and he did so with the same ease that he had played the coarser roles. This proved quite successfully that Coburn was a highly skilled actor. 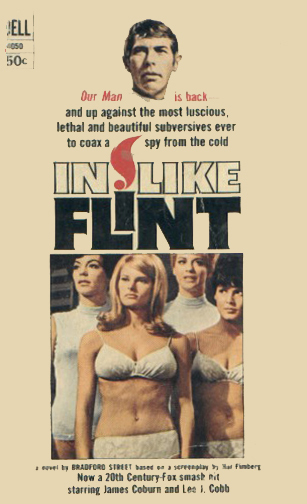 The success of any movie naturally breeds the desire for a sequel and two years later Coburn returned in 'In Like Flint'. This movie did not, apparently, do as well and the franchise stopped at two. The abilities and achievements of Derek Flint was far too numerous to list here. Just a few include a Black Belt in Judo, Olympic medals in at least 5 different events, degrees from 17 different universities, highly prized paintings, and the ability to speak fluently in 45 various languages and dialects. Flint was also, according to his 'boss', the most undisciplined, insubordinate man he had ever had to deal with. During WWII, this boss, Bruce Cramden, was Flint's senior officer and as such had the unfortunate task of trying to lead the versatile man. Now many years later, when a crisis arises that demands someone of Flint's abilities, he has to mend fences and get Derek help to save the world. Luckily, Flint is back in town, having just flown in from Moscow where he was asked to teach ballet. A dastardly group of scientists have banded together, called their organization GALAXY, and created the technology to control the weather. Using it to drastically change the patterns around the world, they plan to extort from the governments of the world total disarmament to bring about peace and give GALAXY the chance to correctly rule the planet. Feminists have decided enough is enough and they are taking back the world. The first step is to replace the male leaders of the major powers with identical replicas, dedicated to their masters. When the President is replaced, Cramden begins to suspect and calls in Derek Flint to solve the problem. In 1966 with the Bond craze going strong, numerous people tried to imitate him. One of the very best, good enough to talked about without automatically mentioning 007's name was Derek Flint, fantastically played by James Coburn. The movie was a hit and demanded a sequel. Unfortunately, that was it. Ten years later, an attempt was made to resurrect the character, this time retired and working as a private investigator. A TV movie was made as a pilot for a possible series. It did not take so the pilot is all that exists. Check out a terrific review of the movie at Permission To Kill. The owners of the Flint rights have released a DVD collection entitled the Ultimate Flint Collection which has all three movies in it, though I believe the first releases of this might not have it. Scientists are using their special skills to change the weather, all to bring the world to its knees and cede control to them. A group of women are using their particular skills and allures to dominate the men in their lives, aiming for dominating the world. When a high ranking oil executive is kidnapped by a Middle East radical group named B.E.S.L.A, the corporation turns to former Z.O.W.I.E. top agent and now private investigator Derek Flint to get him back. Assisting him is the gorgeous Ms. Rogers. Comicbook company Moonstone, a firm that specialized in bringing back characters from bygone days and revitalizing them, did so with a single Derek Flint comic. According to my reading, he no longer works for Z.O.W.I.E. but instead is lead agent for M.A.C.E. (Mandated Actions for Covert Enforcement). Check out the website Double-O Section for more information. Megalomaniac and would be world-order restorer Dr. Nova has a powerful laser he is planning to fly into space with which to control the planet unless Derek Flint and his two lovely, bikini-clad assistants can stop him. A promotional series of 8 color cards that were displayed in theater lobbies across the United States that played the movie. 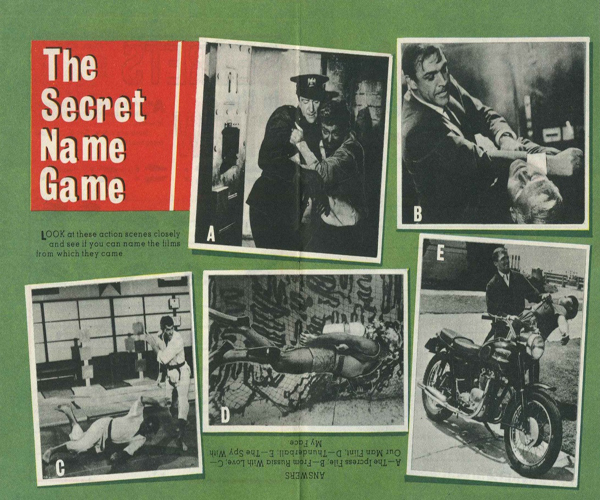 Each card featured a different still photo scene from the movie that is mentioned it the title. In 1972 Harlen Ellison wrote a script for a 3rd "Derek Flint" movie that was never made. It predates the TV movie of 1976. In 2013, the script for this movie that was never produced was released. 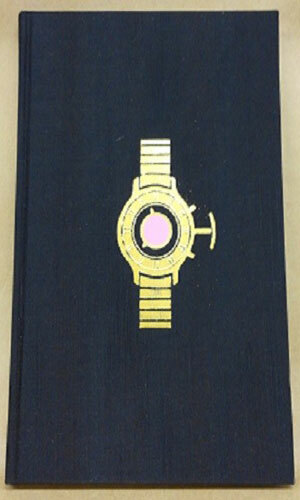 It was limited to 300 numbered copies bound in a black silk cover with Derek Flint's famous wrist-watch hand stamped in gold on the front. When published copies sold for $150. 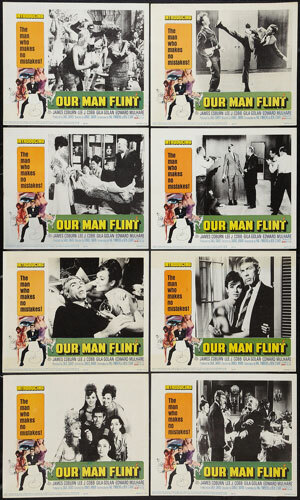 Somewhere quite above the imaginative Bond films but still quite below the zany Austin Powers movies lies the two terrific Derek Flint movies. I loved Flint as he was the best a man could be and enjoyed all the wonderful rewards of being the best. The movies were campy as heck and did not worry about logic too much as they were intent on having fun. Fun they were. The book novelizations are quite respectable jobs of writing, especially the first, but suffer the common malady of the novelization in that the source material is a visual medium. A sly wink on the screen is hard to describe on a page. Still, they are fun reads. 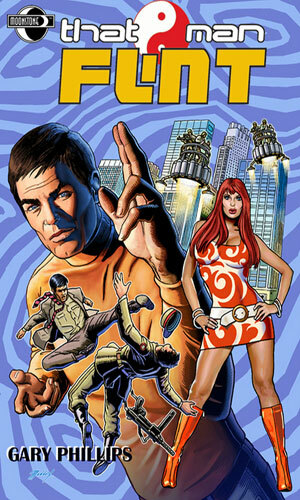 I haven't managed to get hold of the novels but I have enjoyed the movies - even seeing the debut episode in a reprint at the BFI - they have a slightly goofy sixties playfulness which really works thanks to James Coburn's wonderfully detached hero. Yes, they are totally OTT and very very bizarre but they are supremely enjoyable, even if the production quality's a bit hit and miss. It's hard to tell if Flint is supposed to spoof Bond or just be a US-Bond, either way I like his know-it-all genius and his stressed out boss and his gaggle of dolly birds and despicable villains. Great fun.